Hi all, Now that I've got various issues with the laptop sorted, (Thanks Ken B) I'm now getting ads popping up all over the place, even along the bottom of the page on emails as well as down the side. So Googling "free adblock" sites, I'm now faced with a myriad of different applications. So I need a straight forward, easy to download, adblock. The benefits of ad blocking include quicker loading and cleaner looking web pages free from advertisements, lower resource waste (bandwidth, CPU, memory, etc. ), and privacy benefits gained through the exclusion of the tracking and profiling systems of ad delivery platforms. Blocking ads can also save substantial amounts of energy. Users who pay for total transferred bandwidth ("capped" or pay-for-usage connections) including most mobile users worldwide, have a direct financial benefit from filtering an ad before it is loaded. Streaming audio and video, even if they are not presented to the user interface, can rapidly consume gigabytes of transfer especially on a faster 4G connection. It is a known problem with most web browsers, including Firefox, that restoring sessions often plays multiple embedded ads at once. Using an advertisement blocker stops such behaviour. No adblocker will completely remove all ads.... but they will get rid of about 90% - 95% of them. Once installed, I recommend that you update the blocking definitions. 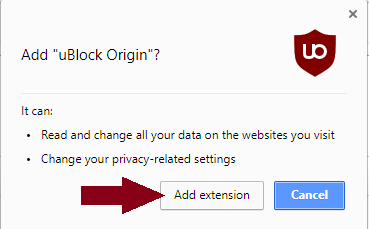 Tools >> Add-ons >> Extensions >> Options in uBlock Origin. Scroll down and click on Show Dashboard. 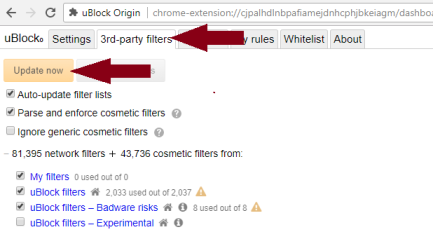 Now click on 3rd Party Filters >> Update Now. 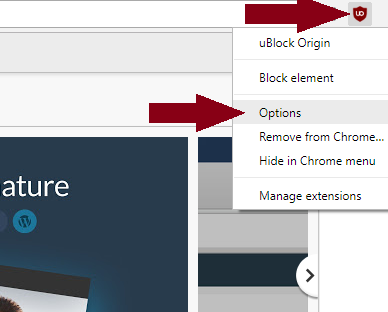 Right click on the uBlock Origin icon (top right of the browser) and select Options. Since uBlock Origin is not available for IE, I'll recommend you install Adblock Plus for Internet Explorer instead. Click on Install for Internet Explorer. Click on Run notification at the bottom of the browser. If you now get a notification saying IE is still running, would you like to shut down.... click Yes. Follow the install pages by click next and finally finish. The Adblock Plus for IE browser helper object is ready for use..... click Enable. Hi Starbuck, Thanks for your info. It would appear I'm using Google Chrome! Following your link & clicking on "Add to Chrome" I get a box saying something like "It can read & change all your data on the websites you visit" &" Change your privacy-related settings" Then "add extension or Cancel? I don't see any icon. I tried to attach a screen-shot of the page, but it wouldn't paste. 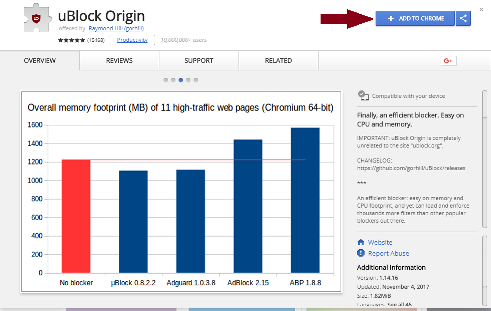 Click Add to Chrome from the download page. Hi Starbuck. Sorted, no problems this time. I appreciate the help I always get when I need solutions to PC problems. And in the time honoured words of 'ol blue eyes, "I've had a few"
Glad everything is sorted BJ.